Dark Dreams Don't Die, or D4, is an Xbox One exclusive episodic game that tells the story of a time-traveling detective trying to solve and prevent the murder of his wife. Japanese game designer Hidetaka Suehiro, or Swery, is developing this game. The cel-shaded game is centered around the Kinect—you will be interacting with an intuitive environment much like in the PS3 title Heavy Rain. 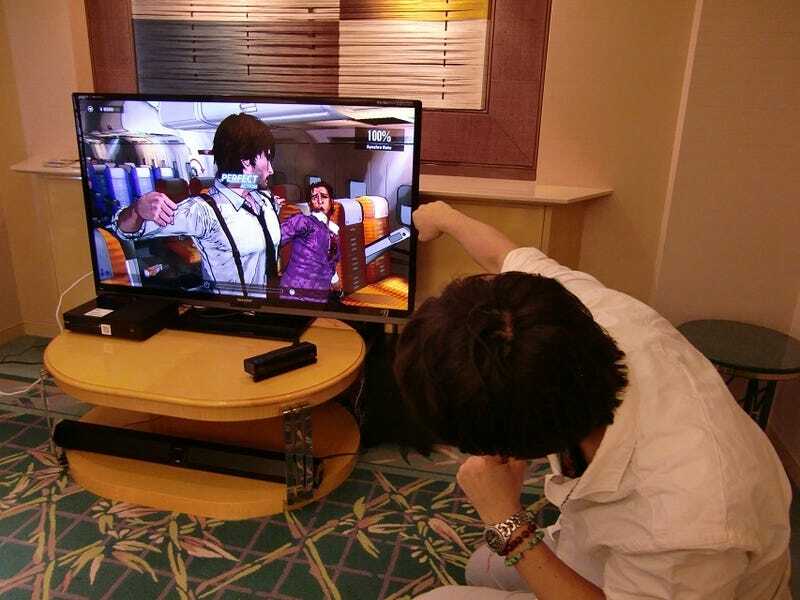 Although the game will fully support controllers, Swery emphasized how it can be easily played while sitting down with the Xbox One's Kinect. Basic movement controls can range from simply swiping your hand left and right to look in different directions, to swinging your fists during action scenes. There are also voice-controlled conversations where you may choose dialogue options verbally (or with a controller if you don't want your neighbors to think you're crazy). Every decision will have a synchro-rating, which shows you how much you understand the main character. Unlike Heavy Rain, though, there is only one core storyline, with small changes that may be affected by your decisions and QTE performance. Many QTE instances will have scores grading you on how accurate you were, and you may change the difficulty to make the sequences less straining for a lower score. Swery did mention that "retrying instances can be done quickly so as to not frustrate the players." Aside from swinging your fists at the TV screen, you can look around the environment and eat random food and drinks scattered everywhere. In fact, if you wish to look at every little crook and nanny, you will have find all the food you can as interactions with objects require stamina that can only be restored by eating. Fortunately, you will have a special vision-mode (activated by making glasses with your hands) to highlight objects to interact with. Every episode will have 2 to 3 hours worth of gameplay alongside sidequests. A mystery drama in the form of an interactive story, the Xbox One exclusive game aims to immerse the players in its quirky yet dark world of murder, fist swinging and time-traveling.